The earthquake that happened in Bohol last month is another eye-opener to Metro Manila citizens. We are as vulnerable as the Boholanos are. According to the Philippine Institute of Volcanology and Seismology (PHIVOLCS), a major fault line passes through Metro Manila. This fault line is the West Valley Fault or more popularly known as Marikina Fault Line. Marikina Fault Line passes through the eastern part of Metro Manila. It passes through Marikina City, Quezon City, Pasig City, Taguig City, Muntilupa City and some towns in the Provinces of Rizal and Laguna. For maps affected by the Marikina Fault Line, please read my post PHIVOLCS Map of Marikina Fault Line Affected Areas. PHIVOLCS, with the funding from Japan International Cooperation Agency (JICA), conducted a study on earthquake impact reduction for Metro Manila. The study contains information about the earthquake damage scenario for Metro Manila, damage estimation due to earthquake, and a master plan and action plans for safer Metro Manila. Those who are interested in this research study should visit the Metro Manila Earthquake Impact Reduction Study (MMEIRS) page in PHIVOLCS website. An interesting information that I saw in the MMEIRS is the map showing the areas that are most vulnerable if Marikina Fault Line will cause a very strong earthquake. 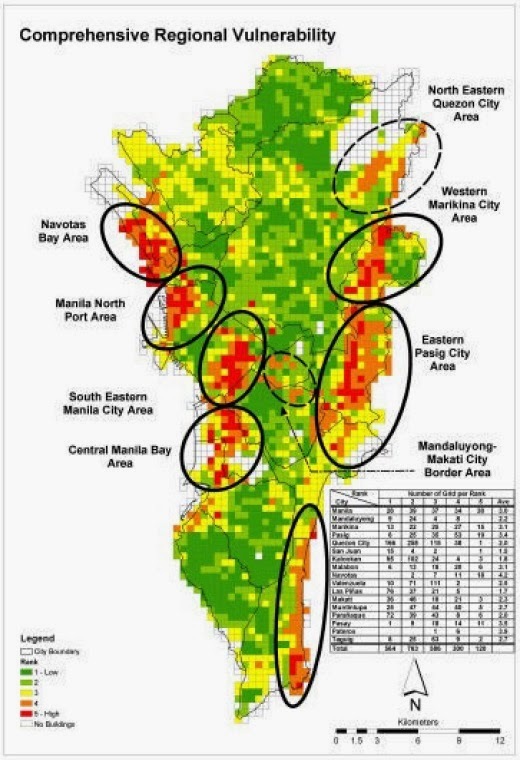 The areas encircled on the map corresponds to the areas listed in the study that is highly vulnerable to earthquakes caused by Marikina Fault Line. Here is the list as shown on the study made by PHIVOLCS. The list shows that Navotas Bay Area, Western Marikina City Area, Manila North Port Area, Eastern Pasig City Area, South Eastern Manila City Area, Muntinlupa Laguna Bay Area, Central Manila Bay Area, Mandaluyong - Makati City Border Area, and North Eastern Quezon City Area are the most vulnerable areas. The MMEIRS is very valuable since it gives us information of the areas that will be severely affected by a big earthquake. All residents of Metro Manila, especially those who are living in the 9 highly vulnerable areas, should keep in mind these information. Let us all prepare and be ready because it is just a matter of time before Marikina Fault Line will cause a big earthquake. For more earthquake preparedness tips please read PHIVOLCS Tips on Being Prepared for Earthquakes and Tsunami. You may also read all of my posts related to earthquakes and tsunamis. Just a clarification, on the ground shaking hazard for Metro Manila, all cities near the West Valley Fault will be having Intensity 9 based on the given legends, however, it was also stated that Pasay, Paranaque, and Navotas will also have intensity 9 in which they are already away from the fault line. Any facts on this sir? I am not an expert when it comes to earthquakes so I cannot answer your query. Do you have the link to that study that mentioned?